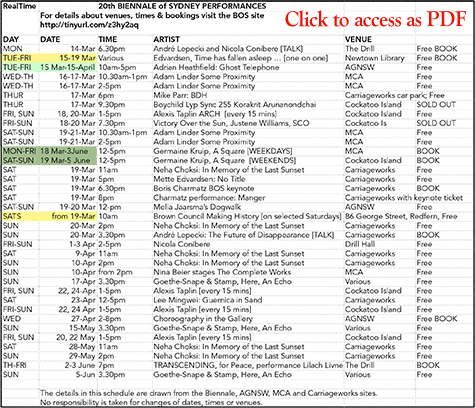 On this page you can open a PDF that details many of the performances and several talks in the 20th Biennale of Sydney in an easily readable form. I made this after struggling to achieve an overview of the performance program that is clearly an important component of this biennale. The Biennale of Sydney, Carriageworks and the MCA. Nowadays, you expect to find performance art in international art biennales, even more so because of its Marina Abramovic-led resurgence and popularity (if presented as spectacle). But dance? Occasionally, yes, given Modernist dance’s intimate kinship with the visual arts and the significance of some key 20th century collaborations. But, centre-stage? There are some obvious reasons: galleries and biennales are increasingly opening themselves to performance, performative installations and new media art—in the long wake of the 60s video art revolution. As well, the visual arts and dance have shared an intensive engagement with high theory and the academy, more palpably so than music and theatre. Even so, dance? Clearly, Biennale Artistic Director Stephanie Rosenthal (chief curator of London’s Hayward Gallery since 2007) rates performance, and especially dance, highly. In 2010 for the Hayward she curated MOVE, Choreographing You, Art & Dance with a pronounced interplay of dance and visual artworks, public participation and a roll call of influential dance artists and videomakers. A book documenting that event appeared in 2011 (MIT). That Rosenthal is on a crusade to open up the gallery to performance is confirmed by her choice of biennale keynote speaker, the dancer-choreographer-philosopher Boris Charmatz, Director of the Musée de la danse-Centre choréographique national de Rennes et de Bretagne. Also telling is the presence of Brazilian-born, New York-based writer, curator and specialist in performance and choreographic studies, André Lepecki, whose interest in the dance-visual arts connection is evident in the title of his latest book Singularities: dance and visual arts in the age of performance (forthcoming Routledge, 2016). Having absorbed the Charmatz-Lepecki takes on the performance/gallery nexus and the Biennale’s examples of its potentials, Australian contemporary dance artists, writers and scholars will gather several weeks later for “a salon” titled Choreography and the Gallery (2-8pm, 24 April, AGNSW) to discuss, and perform, their own responses. Charmatz also engages with large numbers of the public. He took his ‘portable’ (another of his ideals) Musée de la danse to the Tate Modern Turbine Hall. Over two days, he and his dancers instructed amateurs and members of the public to create joint performances interpolated with Charmatz’ own. Enfant, which has played in London, Avignon and Salzburg, features nine dancers, 23 untrained children “with a lot of freedom,” a crane and a huge treadmill-like machine. The work appears to alternate between innocent playfulness and haunting images of the manipulation of inert bodies. After his keynote address, Charmatz will perform in his own words, “the very strange piece” Manger with local dancers. Berlin-based Australian writer, dancer and choreographer Adam Linder, who created the striking Are We That We Are for Sydney Dance Company in 2010 and has performed with Michael Clark, Meg Stuart/Damaged Goods and The Royal Ballet, will present Some Proximity. This is the the second of his hire-by-the-hour Choreographic Services. “Two dancers respond to the written observations of an arts writer, who minutes the artistic or social contexts of the location of the hired service. In responding to the observations with danced action, the writer seeks to collapse the viewers’ critical distance to the work” (ICA). On the page, some works look simply mysterious, like Ghost Telephone, a “one-month-long chain performance” curated by the UK’s Adrian Heathfield, a key writer about and curator of experimental performance and dance. The piece comprises, “interlinked new performances from internationally renowned artists. Working in situ, performers channel and transform the spirits of works in the collection and displays of the Art Gallery of NSW.” Open 10am-5pm (see BOS website). In the live art world, one-on-one performances are beginning to inhabit galleries, as did the Perth’s Proximity Festival at the Art Gallery of Western Australia in 2015. In Part of The Future of Disappearance, a Carriageworks-based program curated by André Lepecki, Norwegian dancer, choreographer and performance maker Mette Edvardsen presents Time has fallen asleep in the afternoon sunshine. 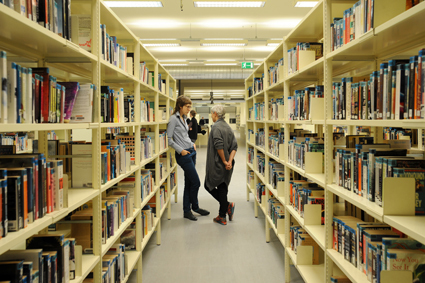 In the Newtown Library, you choose a book from a selection and a portion of it is intimately recited from memory to you by a performer. Australian artist Mike Parr’s much-anticipated new performance, BDH, to be performed in the Carriageworks’ carpark on a late afternoon, will reveal the meaning of its acronymic title. Netherland-born Germaine Kruip’s A Square, Spoken is another one-on-one performance which will be performed many times at the MCA and on Cockatoo Island across the duration of the biennale. In 20 minutes, Kruip ‘walks you through’ our ever mutating notion of the square from Galileo to Malevich to Jung to the present. In terms of this biennale it’s interesting that in 2012 Kruip made A Possibility of an abstraction: Circle Dance, dervish-inspired movement in everyday dress incorporated into gallery or public spaces. In an example of a performer responding directly to an art work, Australian dancer Alice Cummins will engage with her collaborator, Indian artist Nera Choksi’s In Memory of the Last Sunset (a work featuring multi-layered sunsets) by performing for an hour near Choksi’s The Sun’s Rehearsal, 2016, “a site-specific billboard-sized installation” at Carriageworks. “Cummins’ cyclical performance asks urgent questions about the life of an ever-warming planet and the life of an aging body”[website]. London-based artist Nicola Conibere’s Assembly, “designed for galleries, civic spaces and performance places…explor[es] shifts in relation between individual and collective bodies; its configurations respond to the presence of spectators in an investigation of how other people can appear to us.” Assembly acknowledges each spectator’s unique presence without asking them to do more than watch. Assembly is an element of the partnership between the Biennale and Sydney’s choreographic laboratory, Critical Path, where the work will be performed 2-5pm over three days for audiences to come and go as they wish. Nicola Conibere and André Lepecki will be in conversation at the home of Critical Path, The Drill, Rushcutters Bay, Monday 14 March, 6.30pm. The Biennale website account of this work is entirely abstract. A little Googling reveals that in her The Complete Works series, Danish-born, Berlin-based Nina Beier invites “a retired dancer to dance every piece of choreography that they have learnt, enacted in chronological order. The piece is simultaneously a history of a choreographic vocabulary… while also invoking the personal history of the dancer’s experiences” (Tate.org). The dancer in this case is Meryl Tankard, one of Pina Bausch’s leading performers in the Wuppertaler Tanztheater, director of Australian Dance Theatre and creator of many works since. From Speakers’ Corner in the Domain to Wemyss Lane in Surry Hills, this work, performed over three weekends, comprises “site-specific happenings and discursive events.” The artist and the dancer “will develop ‘performative interferences’, literal and metaphorical markers that use language to choreograph the viewer, casting new light on quiet things in the process.” You’ll just have to be there to see what happens to you. 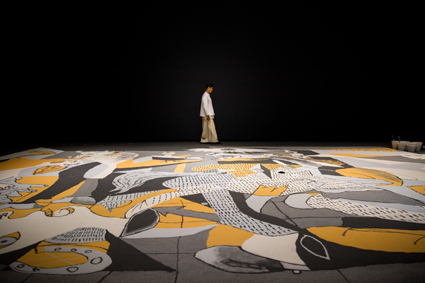 In an enticing one-off performance 12-5pm, 23 April, at Carriageworks, Taiwan’s New York-based Lee Mingwei and collaborators meticulously recreate Pablo Picasso’s famous Guernica (1937) with sand and then transform it, walk on it with the audience and finally sweep it away. In an era of increasingly erased protest and diminished democracy, this work should engender resonances beyond the sense of art’s impermanence. Allow time too to participate in Israel choreographer and performance artist Lilach Livne’s TRANSCENDING, for Peace, in which you become part of “a temporary community” and “audiences and performers join hands, dance, pray and strive for an abstract way of being.” Livne’s works are not at all tame, as her frank, politically and pop cultural vimeo postings attest. The 75-minute work is presented in association with Critical Path and features local performers. London-based American painter, sculptor and performance artist Alexis Teplin will perform on Cockatoo Island amid her own paintings. Critiquing “the fragmentation of language in the digital age,” in her 15-minute performance, she asks, “When decadence fails us in our quest for utopia, where do we end up?” Teplin’s bright, abstract costuming and droll conversational scripting, as in P and C (2014), provide for an arch, theatrical commentary on art and, in Arch, the digital takeover of our lives. From the avant-garde Russia of 1913 comes this Futurist performative critique of opera, originally designed by Malevich and reconceived here by Australian visual artist and performer Justene Williams in collaboration with Sydney Chamber Opera, composer Huw Belling and librettist Pierce Wilcox. Sadly, all three performances on Cockatoo Island are booked out. The Biennale’s mantra “the future is already here—it’s just not evenly distributed,” is true in many disturbing ways across the globe. As we await equitable redistributions of power and resources, and as the Biennale unfolds, we hope at least to witness dance draw the art gallery into the present rather than simply be accommodated by or absorbed into it.